It’s 2019 and your top sales prospects are becoming even more difficult to connect with and even tougher to sell them on your main points. There is so much noise in the sales development world these days that standing out as an SDR takes something truly unique. Below, we’ve shared a few sales outreach tips that you can use as inspiration to help meet your quota this year. Hubspot has proven that video prospecting is truly effective and has bumped up their sales opportunities by 4x. Their sales development reps that used traditional email and phone prospecting earned about 1.5% conversion rate. Those same reps that used short videos to get the main points across and motivate prospects to reply earned a 6% conversion rate! Hubspot’s experiment shows that SDRs that utilize video in their sales prospecting see increased productivity, CTRs, and efficiency. Vidyard GoVideo - Chrome extension that allows you to record yourself, your screen, or both. Videolicious - Videolicious is similar to Vidyard GoVideo, but with the bonus of having built-in scripts and graphics. To put it simply, video is the most engaging content on the internet and will guarantee higher response rates! 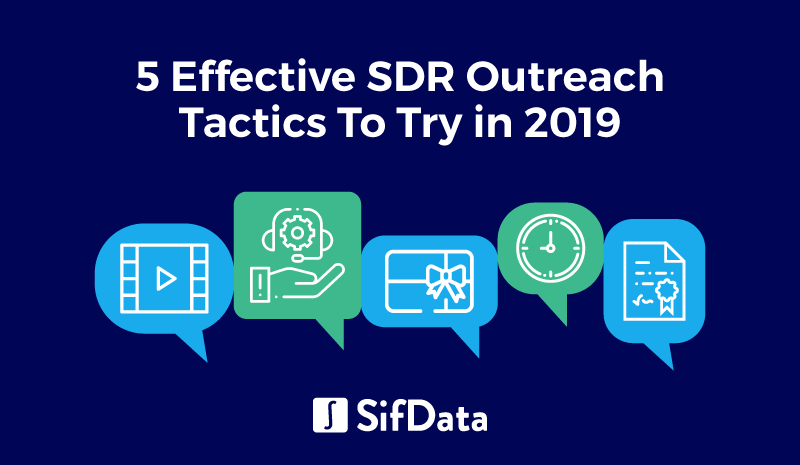 SDR Sam Silverman from outreach.io has been able to consistently hit 180% of his sales quota by doing his research and using personalized emails to better connect with his sales leads. How did Sam do this? Sam devotes his Wednesdays and Sundays to engaging with content that his prospects were sharing and creating. This helped increase awareness of himself and his brand. - Recommending content they might find useful based on what they are sharing on social media. - Recommend social media groups based on their interests (especially if they are non-business related). - Use sales enablement tools like Owler to gain insight into the inner-workings of their industry or company. - Try out our native Salesforce application, SifData to see if your prospect has moved to a different company and engage with them there. Convince your prospect that they are valued by going above and beyond and I guarantee you’ll see results like Sam. The majority of sales management leaders are getting flooded with emails and phone calls. Use physical letters to spark your prospect’s curiosity. Whether it’s an Xmas card from Grammy, package from Amazon, or a handwritten letter from an old friend across the country, everything that ends up in your mailbox almost always gets opened. Whether you’re CMO of an IoT company that’s getting press coverage or a sales manager trying to get in front of a prospect, sending targeted letters and packages works. - Take notes during conversations with sales contacts in order to send more personalized packages and hand-written cards that will have a lasting impact. - Ask for permission to send something to their home or business address. Integrate their address to their contact information in Salesforce. - Send your letter with a bulky item to make sure it gets opened. - Make the headline powerful, attention-grabbing, and place it 1/4th down the page. - Include your logo and branding into the sales letter template. - Add testimonials from current customers and a strong CTA in the conclusion. Try sending a personalized letter to your next sales lead and see what happens! It’s common sense as a sales enablement professional to not call leads at the end of the day on Friday when they are getting ready for a relaxing weekend. What if you could take advantage of times like first thing in the morning or when the office day is winding down to give your sales target a call? By understanding your client’s schedule, you can increase your chances of reaching them and converting them. One quick tip is to send emails on evenings and weekends for the most likely chance that they’ll answer your calls or emails. Learning is part of what we do everyday. When it comes to our career or hobbies, the only way to move forward is to learn. Likewise, helping others grow is rooted in educating. If you have the ability to show sales prospects how they can improve their situations, then why not give it a shot? Simply put, it’s your job as an SDR to inform sales prospects of a problem they don’t know about and inspire them to take action. What Can You Learn From CharityWater? CharityWater uses this brilliant video to educate viewers on the crucial aspect water plays in many people’s lives and how other people take it for granted. By educating viewers on the problem of water shortage and the solution of donating money to their charity, they inspire viewers to take action by donating money to a worthy cause. Use your extensive knowledge of your product or service and which problems it solves to educate your next sales lead! Getting in front of sales prospects can be a pain, but with SifData’s software which integrates seamlessly with Salesforce, you can gain a competitive advantage and increase your chances of converting by knowing when your key contacts and champions move to other companies.